The word Qigong is made up of two Chinese words. Qi is usually translated to mean the life force or vital-energy that flows through all things in the universe. The second word, Gong, means accomplishment, or skill that is cultivated through steady practice. Together, Qigong means cultivating energy, it is a system practiced for health maintenance, healing and increasing vitality. Being an art of self-training both body and mind as well as sending forth external qi, Qigong, created by the Chinese people in the long process of life, labor and fight against diseases, protecting and strengthening health and prolonging life. It is one of the gems in the treasure-house of China's cultural heritage as well as component part of traditional Chinese medicine. Qigong has a long history and diverse schools. As the "internal qi" of qigong and the "external qi" emitted by Qigong masters are invisible and inaudible to ordinary people, Qigong is commonly considered to be mysterious and profound. Qigong is an art and skill to train qi. To be exact, it is a method by which the practitioner gets physical and mental self-exercise through bringing into play his subjective initiative. To achieve this aim, the practitioner must associate his mind, postures and breathing and act on the whole. On one hand, it actively self-regulates the functional activities of the organism and maintains a dynamic equilibrium. On the other hand, it enables the body to produce an "energy-storing" reaction, reduce energy consumption and increase energy accumulation, producing the effects of regulating yin and yang, dredging the channels and collaterals and emitting external qi. 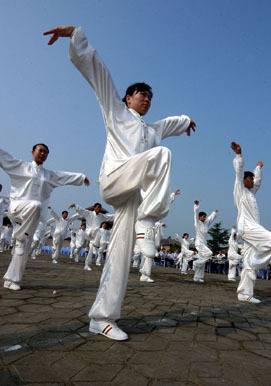 Taijiquan is a style of qigong. It is graceful, relaxed, slow, and fluid, like a slow-motion dance. Unlike some qigong methods that exercise specific systems or parts of the body-- nervous system, endocrine system, heart, kidneys--Taijiquan is a whole body, whole mind exercise. It treats health systemically, restoring the body to its original "program", uncorrupted by stress, pollution, and disease. The Qigong Research & Practice Center offers training in all aspects and levels of Taijiquan. When the training practice reaches the Qigong state, the electroencephalograph dynamic process research finds: the peak frequency under Qigong state diminishes in accordance with the variations of time, the dynamic variance falls and the fluctuation of the peak amplitude diminishes. It can be seen that the EEG stability is enhanced and the ordering degree is improved. Meanwhile, the rhythm of the frontal region is strengthened, indicating that the control of the brain over the activities of the internal organs and the incretory glands is somewhat strengthened. Under Qigong tranquilization, various components of the body-sensory evoked potential in the experiment display various degrees of restraint, the late components being the most obvious in particular, manifested by descent of wave amplitude or distortion of undulate form. Some components have disappeared. The researchers hold that this is because in the process of Qigong, through auto-regulation the reticular structure is made to produce an ascending restraint over the sensory transmission. In addition, in the process of Qigong tranquilization the sense perception of electrical stimulation reduces or disappears, denoting that the response to sensual stimulation is reduced. The determination of the skin electrical potential of the acupoints Feishu and Mingmen finds that the skin electrical potential is reduced in the process of the training practice. During the training practice, the Dantian and other regions' body surface temperature rises. Meanwhile, it can also be observed that when the training practice reaches the tranquilization state the heart rate slows down, while the volume of the ear lobe blood vessels increases, the two presenting a negative correlation. These discoveries show that Qigong dirigation can reduce the excitability of the sympathetic nervous system in the vegetative nerves and raise the excitability of the parasympathetic system. When the training practice has reached the tranquilization state, the relaxation degree of the skeletal muscles is increased and the electromyogram presents single electrical potential pattern or electrical quiescence. During the training practice, the frequency of respiration obviously decreases, the depth of respiration deepens, the pulmonary ventilation volume reduces, tidal volume increases, the carbon dioxide component in the expiratory air and alveolar air increases while the oxygen component reduces. These show that in the process of the training practice respiration is in a spontaneous weakening state. Qigong dirigation can increase the peristaltic frequency of the stomach and intestines, strengthen their contraction and cause the hyperfunction of the intestinal gurgling sound, promoting the secretion of gastric juice. These effects also indicate that the training practice lays the cerebral cortex in a specific qigong state and regulates the functional condition of the vegetative nerves, manifested as the rise of the excitability of the vagus nerve and the fall of the excitability of the sympathetic nerve, thus regulating the movement and secretory function of the stomach and intestines. Meanwhile, the respiration exercise of qigong is dominated by diaphragmatic movement. The deep and profound abdominal respiration can increase the amplitude of the diaphragmatic movement by 3-4 times, changing the intra-abdominal pressure and promoting the peristalsis of the stomach and intestines. Sit up straight on a square stool, with the trunk and thighs, thighs and shanks in an angle of 90° respectively at the suitable height, the knees separated shoulder-width apart, the feet firmly placed on the floor, the hands naturally placed on the knees or thighs, the lower jaw slightly drawn in, the shoulders relaxed and the chest slightly drawn in, the mouth and eyes slightly closed, the tip of the tongue raised against the hard palate and a smile on the face. Sit up straight on a wood bed with the legs crossed in the shape of the Chinese word "". (eight), sitting naturally with the legs crossed, the hands placed on the knees or with the fingers interlocked before the lower abdomen, palms facing upward. The postures of the upper part of the body, head and upper limbs are the same as in Plain Sitting Posture. Lie on the back on a wood bed with the upper part of the body cushioned slightly higher presenting a sloping position, with the legs straightly stretched, the hands placed against the sides of both legs or on the lower abdomen with one palm over the other (palms facing downward). The requirements of the head are the same as in Plain Sitting Posture. Take the Tri-round-style Standing Stump for an example. Stand with the feet parallel to each other 3-4 foot-widths apart (the space can be regulated in accordance with the height of the stance), head and neck right straight, the lower jaw slightly drawn in, the chest slightly drawn in and back erect, the hip relaxed and knees bent, the eyes looking straight ahead or slightly closed; the arms presenting an embracing gesture with the five fingers of each hand naturally separated and lightly bent as if holding a ball, the fingertips of one hand pointing at those of the other, about 30cm apart, palms facing inward; the mouth naturally closed, the tongue tip raised against the hard and a smile on the face. Stand still for 2-3 minutes, then left foot takes a step forward first, with the heel touching the ground first, the upper part of the body and the hands swinging to the right, inhale through the nose and exhale through the mouth; when the left foot fully touches the ground, take the right foot one step forward with the heel touching the ground first, the upper of he body and the arms swinging to the left, inhale through the nose and exhale through the mouth. Walk forward step by step as described above and end the exercise after walking for about half an hour. Without exertion of mindwill, breathe naturally. This refers to the method of respiration in which the diaphragm descends with the abdomen bulging out in inhalation and the diaphragm rises with the abdomen drawn in exhalation. Contrary to the above method, this refers to the method of respiration in which the abdomen is drawn in inhalation and bulges out in exhalation. This refers to the respiration method which requires pausing and closing qi for a little while after each inhalation (exhalation) and then exhale (inhale). This refers to the respiration method to inhale through the nose and exhale through the mouth. The mind is highly concentrated on certain part of the body, certain acupoint or certain object outside the body, usually concentrated on Dantian. The concentration should be obscure, without any forceful exertion, relaxed and natural, being just right. The mind is highly concentrated on respiration, concentrated only on the rise and fall of the abdominal respiration without the conduct of mindwill so as to form a unification of mindwill and qi and reach a tranquil state of mind. During the training practice, count silently the time of breath till the ear fails to hear, the eyes fail to see and the mind fails to think thus naturally reaching a tranquil state of mind. Read silently certain single word or phrase, for instance, the two words" relax" and "tranquilize", one word for exhalation and inhalation respectively. Its purpose is to replace the myriads of thoughts with one thought, replace all stray thoughts with the orthodox thought, gradually achieving a state free from stray thoughts and full of relaxation and joyousness, and comfortably reaching a tranquil state of mind. Relaxation Qigong aims at regulating the whole body into a relaxed, comfortable and natural state through a step-by-step and rhythmical relaxation of all parts of the body coordinated by silently reading the "relax"-character formula. This maneuver has the functions of activating qi and blood, coordinating the internal organs, dredging the channels and collaterals, strengthening health, preventing and curing diseases. Assume the standing, sitting or lying posture, with the tongue-tip raised against the hard palate, the eyes slightly drooping, the chest slightly drawn in and the back erect. Regulate breathing and concentrate the mind on Dantian. Tri-route Relaxation Method can be conducted on the foundation of reedy preparations. The firsts route: From the bilateral sides of the head, the bilateral sides of the neck, shoulders, upper arms, elbows, fore-arms, wrists and two hands to the ten fingers. The second route: From the face, neck, chest, abdomen, two thighs, knees, shanks and two feet to the ten toes. The third route: From the back of the head, posterior nape, back, waist, posterior parts of both thighs, two popliteal fossae, two shanks and two feet to the soles of both feet. First relax from the first route, going on from above to below. Having finished the first route, go on to the second and third routes. Generally, first focus on one location of one route and silently read the word "relax" (without any sound), then focus on the next location. Relax in this way link by link, route by routes, for 3-5 cycles altogether. On the foundation of the relaxation of the three routes, the relaxation of certain part of the body can be carried out individually, such as the relaxation of the tension points and the locations of diseases and pains. Concentrate the mind on these locations and silently read the word "relax" for 20-30 times. Regard the whole body as a point to relax. One can read silently to effect a general one-shot relaxation from the head to the feet; or silently meditate to fly and fall from a high palace to relax or silently meditate to relax downwards continuously like water flowing along the routes of the Tri-route Relaxation Method. Inner-Nourishing Qigong is a maneuver featured by the coordination of silent reading of words or phrases with respiration exercise. It has fairly food regulating effects on the functional activities of the nervous, circulatory and digestive systems. The lying and plain sitting postures are the most suitable. Just before the training practice, drink a small amount of boiled water, loosen the clothes and belt, get rid of all stray thoughts and relax the mind. The phrases or sentences for silent reading generally begin from three Chinese characters, to be increased gradually as time goes on, but ought not exceed ten characters at most. The content of the phrases or sentences are usually related to qigong dirigation, such as " tranquilize by myself", "I can relax and tranquilize", "sitting still leads to good health" and the like. The method of respiration is: inhale when silently reading the first word; hold one's breath when silently reading the middle word or words, the more the middle words are, the longer the time of holding breath is; exhale when silently reading the final word. When inhaling, raise the tongue against the hard palate, naturally conduct qi to the lower abdomen and imagine in the mind "Qi sinks to Dantian". When exhaling, detach the tongue from the hard palate so as to allow air to go out naturally. During the practice of the above method, attention should be paid to inhalation rather than exhalation.